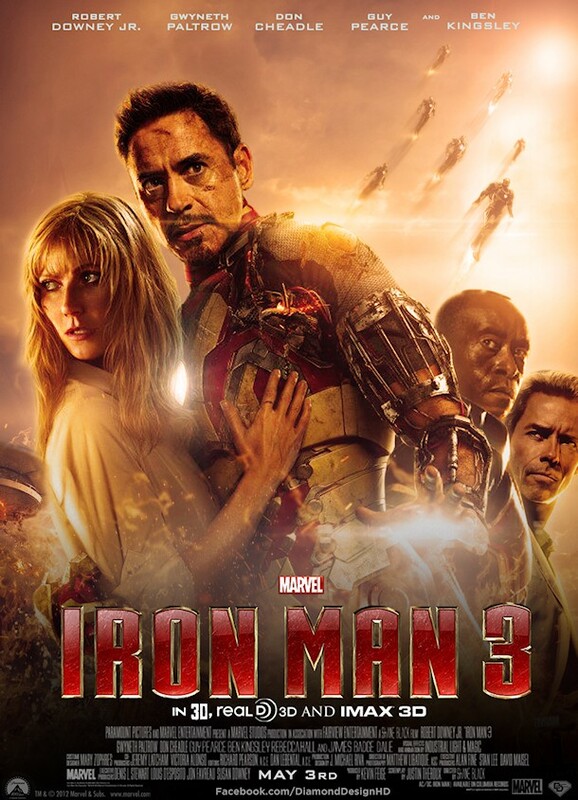 Iron Man 3 is the first big, bloated, summer blockbuster of 2013, or should I say the Year of the Snake, in order to please China? The producers of Iron Man certainly think this concern is legitimate, and have extended a mandarin-language subplot for a custom cut of the film that will play specifically for the Chinese. This Mandarin language sequence should not be confused with the “The Mandarin,” (Ben Kingsley) the film’s primary villain, a terrorist who is, in fact, not even the slightest bit Asian. Confusing? Not exactly, No, but still messy. And there you have it, the modus operandi of this third installment, which clocks in at a lengthy 130 minutes, and runs all over the place during that time. When Tony Stark (Robert Downey Jr.) finds his personal life in shambles, he must don his Iron Man suit to track down the confusingly named terrorist, at the risk of his personal life and the people he cares for most. Although this sort of plotline would seem to be a simple one to digest, there is a certain hodge-podge of ingredients that only risk spoiling the soup, but never properly do. Various contributing elements throughout the film are faithfully extrapolated from the original Marvel series, perhaps to soothe the wanton needs of the notorious fan boy base. Where did these self-healing Wolverine wannabes come from, and what is their motivation? What happens to Stark’s Siri-trumping robot companion Jarvis (voiced by Paul Bettany)? Why does the finale take place on an oil rig? None of these questions matter, because everything ends up wrapped neatly in a tight bow, but any discerning viewer will still pick at the seems and find the plot logic easily un-raveled. Worst of all, there are even a few awkward, contrived mentions of the events that happened at the end of The Avengers, which existed in a far more fantastical world. Yes, Tony was there, but wouldn’t it have been better to simply omit mention of the Aliens, the wormhole, the giant airship, and Thor, rather than to try and bring the wake of those ridiculous plot elements to the more real-life oriented Iron Man series? None of these slight flaws are enough to crush Iron Man 3, because it still retains its explosive action, and, better yet, its sense of humor. Tony Stark is the Tucker Max of superheroes, and his loutish sensibilities are matched to the tee by his right hand man Happy (Jon Favreau), his fellow suit-wearer James Rhodes (Don Cheadle), and the previously damseled-out but now much more significant Pepper Pots (Gwyneth Paltrow). Even The Mandarin steps up to bring a couple laughs. This spices up the action endlessly, and makes the experience feel more like a Blockbuster than satisfy the proper pleasures in life. Nice review Pria. Not better than the first, but sure as hell better than the second. That’s for sure.